The reigning NL MVP already has his first award of 2019. Christian Yelich was named the NL Player of the Week on Monday after hitting a home run in each of the Milwaukee Brewers‘ first four games of the season. Yelich went 6-for-12 with eight RBI with six runs, four home runs, one double and just one strikeout last week, hitting .500 with a .667 on-base percentage and a 1.583 slugging percentage in four games. 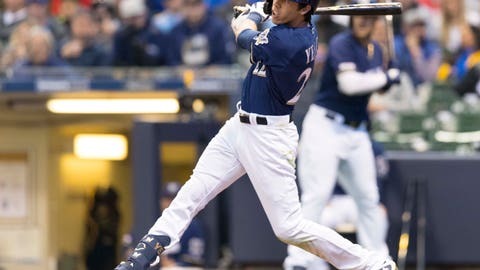 The 27-year-old hit a solo home run Sunday, then hit a walk-off two-run double in the ninth to lift the Brewers to a 5-4 win over the St. Louis Cardinals and a 3-1 series win. Yelich earned 29 of 30 first-place votes in last year’s MVP voting after hitting .326/.402/.598 with 36 home runs in 147 games during the regular season, helping the Brewers to a division title and the NLCS.